Celebrate a newly minted police officer this season with the police officer school graduation gift idea. It's a wonderful way to honor a job well done and a career choice dedicated to serving and protecting others. The gift will be made more special by the inclusion of your personal message of encouragement. 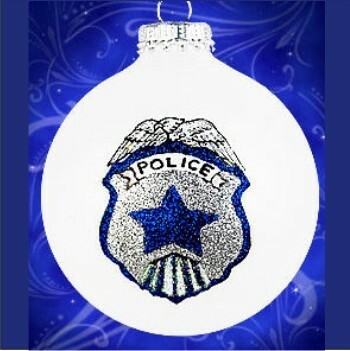 We'll hand paint it on the police officer school graduation Christmas ornament before packing it in a custom gift box. You'll enjoy browsing all of our graduation ornaments to find wonderful gift ideas for the young achievers you want to congratulate this year. New Cop loves it Nov 8, 2014 Debby S.